For years, the Italian journalist Riccardo Orizio carried two yellowing newspaper clippings in his wallet. Sometimes, he says, they fell out at inconvenient moments; at others, he took them out and re-read them, discovering that "they kept my spirits up". One was about the former Ugandan dictator, Idi Amin Dada, the other referred to Jean-Bedel Bokassa, self-proclaimed emperor of the Central African Republic. 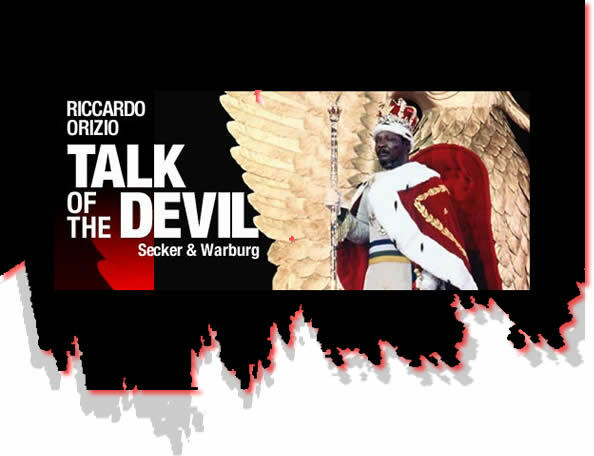 Orizio's fascination with the cuttings eventually led to a quest to track both men down, along with five other former dictators or their partners: Baby Doc, General Jaruzelski, Colonel Mengistu, Enver Hoxha's widow and Slobodan Milosevic's wife, Mira Markovic. He deliberately chose dictators whose careers ended in ignominy, on the grounds that "those who fall on their feet tend not to examine their own conscience". Thus there is no Pinochet, nor any other familiar figure from Latin America, such as Galtieri of Argentina, Rios Montt of Guatemala or the notorious Alfredo Stroessner of Paraguay. This is initially a disappointment, for many of us would love to see Pinochet subjected to a grilling. It is also, as it turns out, a mistaken premise, for with the exception of Jaruzelski, Orizio's subjects could hardly be described as introspective, let alone penitent. On the contrary, they recall the verdict of Graham Greene - who set The Comedians in the Haiti of Baby Doc's father, Papa Doc - on the infantile character Pinkie from his earlier novel, Brighton Rock. "The outlaw of justice always keeps in his heart the sense of justice outraged - his crimes have an excuse and yet he is pursued by the Others," Greene observed. "The Others have committed worse crimes and flourish." Idi Amin, parading his Muslim credentials in Jeddah, explicitly denies feeling any remorse. Nexhmije Hoxha, who presided with her husband over one of the communist bloc's most paranoid regimes, also has no regrets. "I'm innocent. They are mistaken. I wanted nothing but the well-being of my country." Similarly, Jean-Claude Duvalier, recalling the night when, aged 19, he took over from his dead father: "The simple people of Haiti, the black peasants living in poverty, all needed someone to defend them. They needed a new Papa Doc. I had been chosen by Destiny for that role." Destiny, apparently, got it wrong, for Baby Doc now lives in exile in France, where he has found a new interest in solar panels. He has also traded in his first wife for a new companion with model good looks, Veronique Roi. Roi has never been to Haiti but talks about Baby Doc's past with confidence. The accusations made against him are "all lies", naturally, and she has travelled as far as the border in order "to understand the tragic situation into which Haitians have fallen without the Duvaliers". Self-delusion and the capacity to draw others into their fantasies are two of the most striking attributes shared by dictators. But sadly Orizio is not, on the evidence presented here, a consistently tough or challenging interrogator. His questions to Amin follow the Hello! formula of polite generalities - "What do you miss, Mr President?" - which made this reader wonder why he spent so much time and effort tracking down the former tyrant. Orizio's summary of Amin's career includes the undeniable assertion that "behind the carnival antics of 'Big Daddy' there was a reeking trail of blood". One of the world's more enduring mysteries is why the British government, which has an extradition treaty with Amin's host, Saudi Arabia, has not tried to bring him to justice for the murder of thousands of British citizens in Uganda. He recounts the gruesome fate of Amin's wife, Kay, whose arms and legs were cut off after her death - because she had had an abortion, according to Amin - and then sewn back, right to left and vice versa. 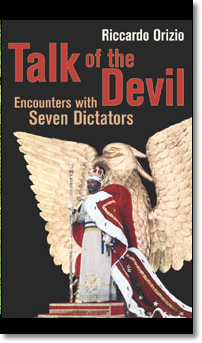 Such anecdotes, and the ones told about Bokassa, make grim if familiar reading. Both men were accused of eating their opponents' flesh and it seems to have been this claim in particular, repeated in those cuttings, that precipitated Orizio's fascination with dictators. Yet crimes against the living are far worse than those perpetrated against the dead, and this sensational detail tends towards making pantomime villains - not to mention stereotypical African cannibals - of two men who are among the late 20th century's most callous mass murderers. To what extent they were deliberately playing on Western prejudices is not addressed here. After talking to Mme Hoxha (the "Black Widow") and Mira Markovic - but not their husbands, respectively dead and incarcerated at The Hague - he predictably asserts that they were the real power behind their husbands' respective thrones. In that sense, the book is a testament to the limitations of this kind of journalism, which mingles reportage and personal anecdotes with interviews that are often decidedly anti-climactic. Orizio's most interesting subject turns out to be Jaruzelski, who has spent his retirement trying to prove that his declaration of martial law in 1981 was inspired by his determination to save Poland from a Soviet invasion. Deported to Siberia as a boy, where he fell in love with the people who had oppressed both his country and his family, Jaruzelski is the only one of Orizio's interviewees who emerges with inner conflicts and doubts. For that reason, some of his omissions no longer seem, by the end of the book, as great a loss as they do at the outset. Clearly it would be harder to lob difficult questions at people who still enjoy the backing of an army, if not actual power. But if Amin was so easily able to disarm Orizio, flipping channels on his wide-screen TV in Jeddah, it is not easy to imagine the journalist challenging wily old brutes like Pinochet or Stroessner. More tea, General?